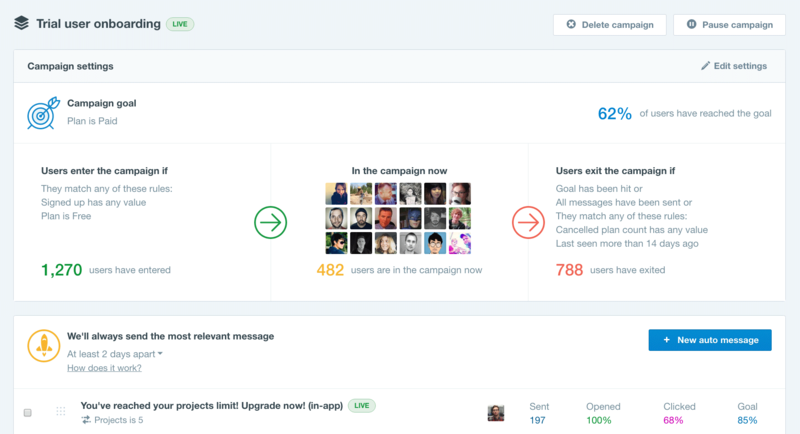 Intercom recently launched Smart Campaigns, their new marketing campaign flow creator. The feature does not use a visual canvas on which you drop messages,create message pathways and use decision trees. Intercom Smart Campaigns adapts the order of messages to match recipient behaviour without predetermining pathways people might take, but based on rules and setting priorities. Their approach to automated campaign flows might solve an issue that many marketing automation and drip campaigns have — the pain you go through when you want to make a small change to the flow. Smart Campaigns can send its messages across a range of channels, including mobile push notifications, email, and in-app messages. A marketer chooses the goal they want to achieve. For instance, send a series of messages to people who start a trial to get them to become paying customers. Set rules for entry and exit, choosing the people to receive the messages. Decide the frequency of messaging. For instance, a maximum of one message every three days. Choose triggers for the messages, based on time, behavior or interaction with other messages. Rank them by priority, the most important message listed first. Intercom was founded in 2011, launched event triggered messaging in early 2014. This April they had a 50M series C funding round led by Index Ventures. Smart Campaigns currently is available as a part of Intercom’s Engage marketing automation solution, which starts at $79/month. Intercom is a single platform which shows who is using a product and send personalized email messages to users based on their behaviour.